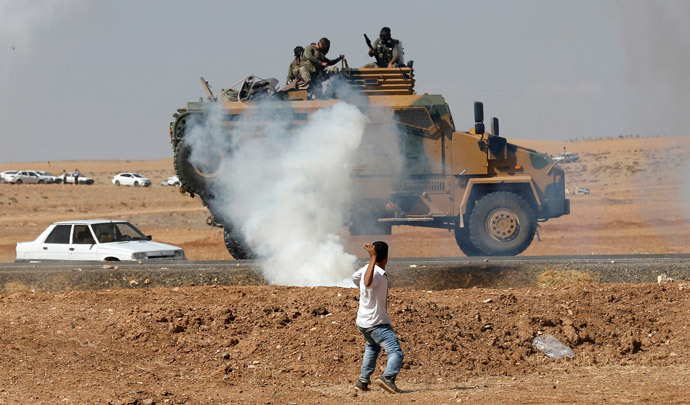 Clashes have erupted across Turkey as Kurdish protesters have taken to the streets against the Islamic State’s advances on the town of Kobani on the Turkish-Syrian border, and what they said was Ankara’s inadequate response to the threat. The Kurdish People’s Democratic Party (HDP) in Turkey summoned the country’s Kurds to the streets to protest IS and the subsequent response from the ruling AKP party. In Istanbul, Turkish police hit a human rights lawyer and protester in the head with a tear gas canister, reportedly leaving him in critical condition. A further protester was shot dead by police, according to local media reports. Twenty-five-year-old Hakan Buksur was killed in Varto, eastern Turkey. Seventeen-year-old Umut Bozkurt was also seriously injured while protesting in Varto, eastern Turkey. Protesters swarmed into Diyarbakir, southeastern Turkey, burning tires, while a statue of Turkey’s first president, Mustafa Kemal Ataturk, was set alight in Baskale, southeastern Turkey. The rally was part of Europe-wide Kurdish demonstrations against the IS offensive, with participants demanding increased aid for the Kurdish forces struggling to hold off the militants in the country. Oxford Circus tube station in central London was temporarily closed overnight after one such protest. The third floor of the European Parliament’s building in Brussels was also overrun by Kurdish protesters. A further 600 people demonstrated in Berlin, and the Dutch Parliament in The Hague was also briefly occupied. Some countries have been arming Kurdish forces or have undertaken airstrikes. However, the airstrikes have not yet stopped the Islamic State offensive. Later Tuesday, Turkey’s President Recep Tayyip Erdogan announced that Kobani was “about to fall” to the jihadists. Some 412 people have died in the three weeks of fighting between IS and Kurdish fighters in Kobani across the past three weeks, according to the UK-based Syrian Observatory for Human Rights.